A bit of heat from the grill brings out the already sweet nature embedded in plums, caramelizing the sugars on the cut surface to wonderfully yummy effect. And, because these luscious summer and early fall delights tend to come into season all at once, finding novel ways to serve them is unusually welcome. 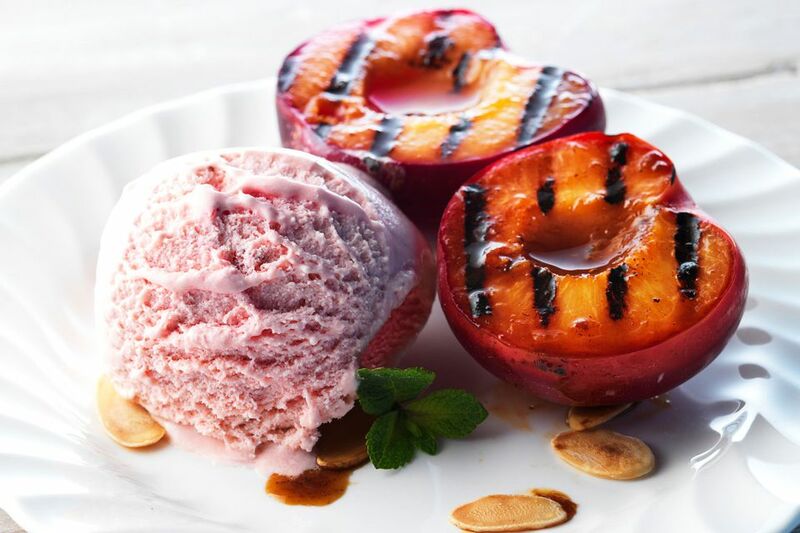 Grilled plums are wonderful alongside grilled pork or sausages, but even better when served with ice cream or frozen yogurt for dessert. Make sure the cooking grate on the grill is scrubbed clean and well oiled, then prepare a charcoal or gas grill to medium hot heat: You should be able to hold your hand about 1 inch over the cooking grate for 3 to 4 seconds. While the grill heats, rinse the plums clean, pat them dry, cut them in half around their pits, and remove and discards the pits. You can peel them first, if you like, but it's not necessary. When all is said and done, I think they look much prettier (and hold their shape better) with their skins on. Put the plums on a tray or baking sheet. Brush them with the oil, paying particular attention to the cut sides. Put the plums, cut-side down, on the hot grill. Cover and cook until they're grill-marked and heated through, about 5 minutes. Serve the grilled plums hot or warm, as a side dish or with ice cream for dessert. If serving as a savory side dish, a sprinkle of salt and a grind or two of freshly ground black pepper is nice. When added to ice cream or served alongside cake, a bit of sugar or whipped cream isn't a bad idea. Turn the plums over after they've cooked on their cut side, sprinkle each half with about 1 teaspoon brown sugar and a bit of cinnamon; cover and grill until the sugar melts and starts to bubble, 3 to 5 minutes. Fill a small bowl with granulated sugar and roll the plums in the sugar to coat them before setting them on the grill. Sprinkle the plums with about 1/4 teaspoon (total, not per plum!) ground cardamom on the cut side before setting them on the grill. Sprinkle minced rosemary on the plums after you brush them with oil as you take them off the grill. Mix 1 teaspoon grated fresh ginger into the oil before brushing it on the plums. A bit of chili powder or red chile flakes can add a hint of spiciness that's pretty tasty with the plums' sweetness.